Bhadra knelt down on the ground with his wrinkled hands clasped together tightly. He didn't know what else to do but pray. His family was growing quickly, but his small hut wouldn't be able to hold them much longer. Some of them already had to stay outside, and what would they do during the rainy season? 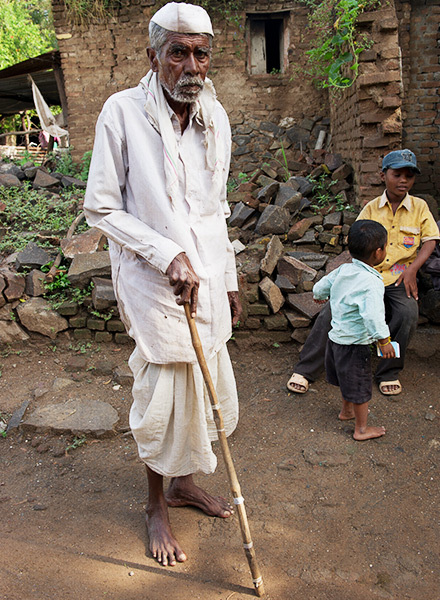 Bhadra was one of the most respected elders of his community. He didn't have much land or money, but the people in the village honored and appreciated him, especially for his wisdom. He was always ready to lend a helping hand to his neighbors and was a strong spiritual guide in the village's traditional religion. When a man came to the village talking about a strange, new God, everyone knew Bhadra would be able to stand up to him. Pastor Rasik came to this village ready to minister Christ’s love to its people, but no one seemed interested. Still, Pastor Rasik faithfully prayed for the villagers daily and visited them often. Then he met Bhadra. The villagers admired Bhadra because of his helpfulness and his wisdom. They looked to him for guidance, especially when it came to their traditional religion. Bhadra often taught about and encouraged the people to stay faithful to their religious rituals. So when Pastor Rasik came visiting, there wasn’t an instantaneous friendship. It took a couple of months before Bhadra began to soften toward the pastor. He started to listen to the Bible stories Pastor Rasik shared, and though he couldn’t read or write, he was able to remember every word Rasik spoke to him from God’s Word. When Pastor Rasik first befriended Bhadra (not pictured), the elderly man wanted little to do with him. Eventually, his heart changed, and he appreciated the stories from the Bible the pastor had to share. When Bhadra became very ill one day, his family asked Bhadra’s new friend, Pastor Rasik, to come pray for him. Soon, Bhadra was completely healed. After this miracle, Bhadra asked Pastor Rasik to stay in his village and teach all the villagers about the love and freedom found in Jesus. But there wasn’t enough room in Bhadra’s small hut for all the people to gather and learn about Christ, so he offered Pastor Rasik a small piece of land and a hut where he could live and teach. As Bhadra and his family listened to Pastor Rasik’s teaching, they chose to receive Christ’s love. Soon, others in the village took notice of the change within their spiritual leader’s life, and three people chose to follow his example and live for Jesus as well. Every week after Bhadra made his decision to pursue Christ, two or three more people would come to the fellowship meeting that was held in the hut. Bhadra and Pastor Rasik were thrilled to see the rapid growth, but knew they wouldn’t be able to hold many more people in the small hut. Bhadra gave more of his land for a church building, but building a new place would involve one obstacle after another. Even if the local believers were able to raise enough money for the materials, they didn’t have skilled laborers who would be needed to complete the process. The nearest highway was about six hours away, which made traveling to and from the village extremely difficult, especially because they didn’t have any reliable transportation. Believers gather together to persevere in prayer for their requests, just like the example of the Bible. The only thing for them to do was pray. Bhadra got up at 3 in the morning every day to pray over the land he’d given to the church. Under the blanket of the still, dark sky, he would plead with the Lord to provide a place for him and his brothers and sisters in Christ. “I prayed to God for only one thing; that was the church building,” Bhadra remembers. As Bhadra continued praying, the local believers gave everything they could toward the building, and God worked in the hearts of people around the world to provide the rest. Finally, after three years of prayer and labor, the church building was completed. The local church leaders, missionaries, believers and villagers all gathered together to celebrate the opening of the new building. More than 130 people attended the celebration. Three years later, the fellowship finally had a building, like the one pictured, that they could call their own. Having a church building now allows Pastor Rasik and the believers to minister to the community through events and gatherings. It gives them protection from the weather that is constantly changing in their area. Bhadra’s 3 a.m. prayers were answered, and his ever-growing family now has enough room to worship and fellowship together. "The Lord Jesus Christ is my provider, and He always safeguards us," Bhadra says. Many other believers in Asia are still praying for a church building. Help build a church today.